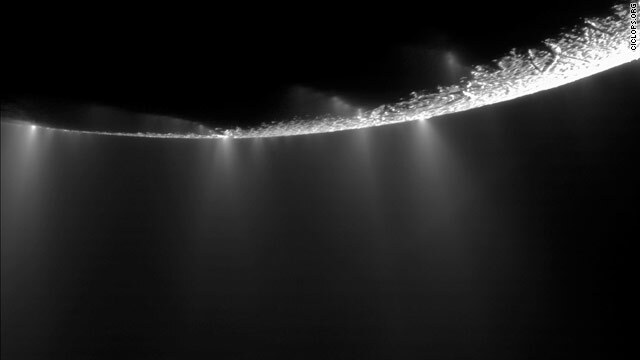 NASA's Cassini space probe snapped this photo of jets spewing from Enceladus, one of Saturn's 53 moons. Where there's salt, there's water and rock, it seems. And where there's water and rock, there could be life. NASA's Saturn-exploring Cassini spacecraft has gathered new evidence that conditions on Enceladus, one of Saturn's 53 named moons, could support life, said Dr. Carolyn Porco, director of the Cassini Imaging Central Laboratory for Operations at the Space Science Institute in Boulder, Colorado. "On Enceladus we have conditions under the surface that we know could be enjoyed by organisms similar to types of organisms we find right here on Earth," she said Friday. "A 'real-time data translator' machine converted a Mariner 4 digital image data into numbers printed on strips of paper. Too anxious to wait for the official processed image, employees from the Voyager Telecommunications Section at NASA's Jet Propulsion Laboratory, attached these strips side by side to a display panel and hand colored the numbers like a paint-by-numbers picture. The completed image was framed and presented to JPL director, William H. Pickering. Mariner 4 was launched on November 28, 1964 and journeyed for 228 days to the Red Planet, providing the first close-range images of Mars. The spacecraft carried a television camera and six other science instruments to study the Martian atmosphere and surface. The 22 photographs taken by Mariner revealed the existence of lunar type craters upon a desert-like surface. After completing its mission, Mariner 4 continued past Mars to the far side of the Sun. On Dec. 20, 1967, all operations of the spacecraft were ended. Visit http://photojournal.jpl.nasa.gov/catalog/PIA14033 for more information."